We started our final full day in Brazil with heavy hearts. 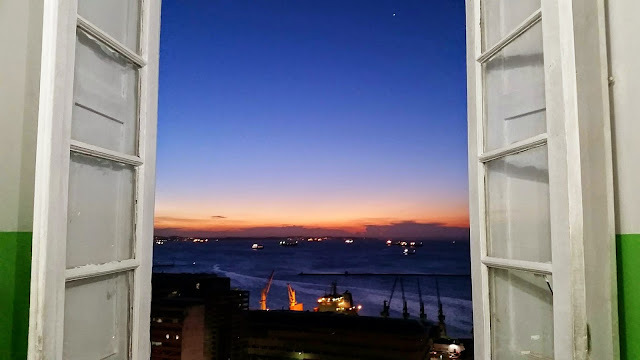 While the group looked forward to a day filled with exciting opportunities in Salvador, we knew we were coming to the end of an incredible journey. We wrapped up our student presentations by hearing from Sophie Margola and Shannon Duffy discussing the history of slavery and the legacy of slavery and race relations today, respectively. After seeing and hearing about these topics throughout the trip, the group was full of helpful questions to guide Sophie and Shannon further along in their research. Our first stop on the day then was at the Pierre Verger cultural center. The center is named after the 20th century French photographer who worked throughout the world but reserved a special affinity for Bahia. At the center, Javier explained the significance of Verger's work in showcasing the lives of the African diaspora at a time that many such people were unseen in photography. The community center is a part of the larger Pierre Verger foundation, working to preserve his work. We were extremely fortunate to have Javier once again, as he is currently finishing a book on the photographer. We were then treated to an amazing meeting with Nancy De Souza who works at the center. Nancy has traveled around the world introducing and explaining Afro-Brazilian culture. Indeed, Nancy will be traveling next month to UCLA to work with professors and students in music, dance, and history classes. 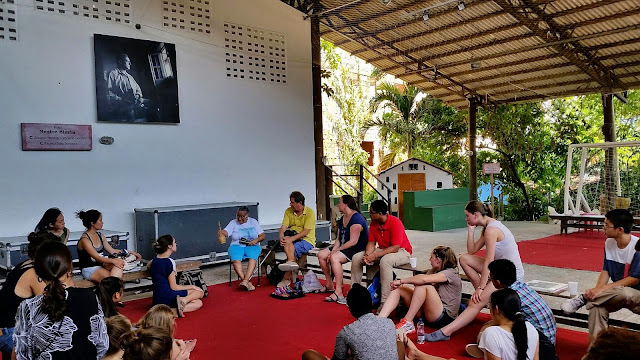 Nancy explained the evolving history of candomble, from a religion that had to be practiced only secretly when she was young, to one that is much richer because of greater acceptance today. Nancy tied candomble to other elements of Afro-Brazilian culture, and explained that this greater acceptance was not easily gained, and that there are still ways to go. With her grace and pure joy, Nancy simply amazed our group. The center was so hospitable, offering us a magnificent lunch with Brazilian meats and vegetables, as we dined with volunteers and employees. With nourishment, we were back on the road to the old city of Salvador, where we first stopped at the Afro-Brazilian museum. 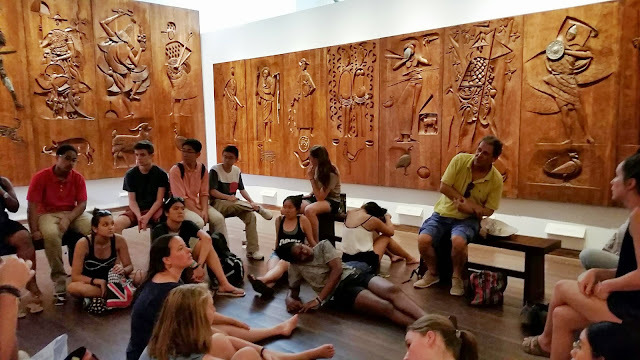 At the end of our museum tour, we debriefed in a room with carvings of 27 orixás completed by the Brazilian artist Carybé in the 1930s. At that moment, we happened to come upon Claudia Santos, a friend of Javier and a professor who teaches on Afro-Brazilian culture. Claudia answered our many questions on the orixás, candomble, and the religion's current acceptance in greater Brazilian culture today. 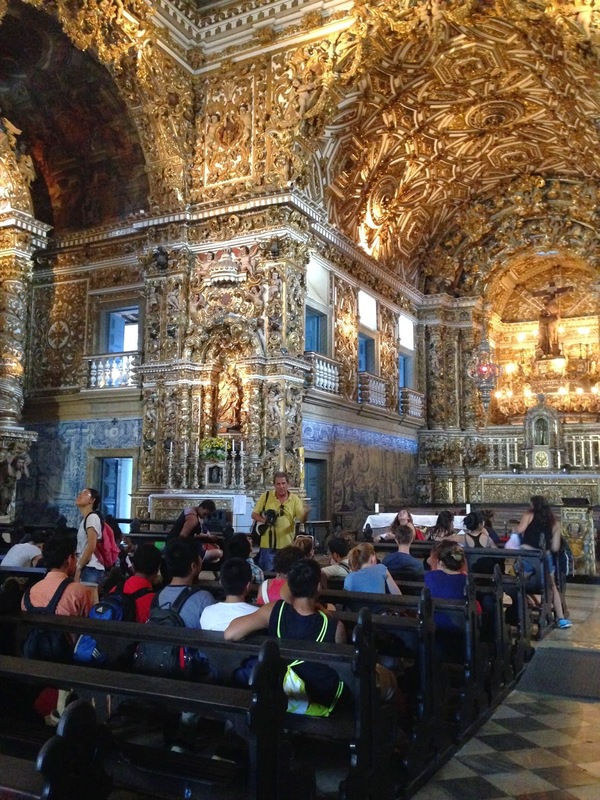 We then moved on to the Church of St Francis, a grandiose example of baroque architecture, built by African slave labor. Javier pointed out to us many elements of the church, including the statues of angels with ironic and sad faces. These faces are reported to have been a subversive way for the enslaved workers to demonstrate their condition. From the church, we were off to the Steve Biko Institute where we learned more about their work in helping underserved youth pass college entrance examinations and find success in college. The representatives from Steve Biko told us that they never had such an inquisitive group, as our NMH students wanted to know more about their operations. We hope that in the future we can arrange a sustainable and meaningful partnership with Steve Biko, with our students sharing their many talents and resources. After dining with graduates of the institute, we were off to another great surprise. We knew we were in store for a dance show, but we could not possibly have been prepared for the breathtaking performance we were witness to. Summing up many of the themes we've discussed with regards to Afro-Brazilian history and culture, the performance was an incredible show of choreography, skill, and athleticism. For Chellandra Samuels, who presented on candomble earlier in the day, the show was "eye-opening...giving me a new perspective on candomble, since dancing is an integral part of the religion. The second dance, 'The Fisherman's Wish,' was my favorite part because I loved how the dance and the music helped me to interpret what they were trying to tell us." For Jessica Yang, a member of the NMH dance company, the show was "a pleasant surprise which reminds me of how I shall not compare art forms from different cultures. Before I saw the show, I couldn't help comparing the indigenous art forms with western art forms, and shamefully I had an implanted notion that indigenous artforms were somehow inferior. However, as the performance sped up at the Dance of Slaves and reached its climax at Capoeira, my mind was changed. The exuberant energy, the complexity of the dance, and the depth of the cultural content are inspiring and mind-blowing. I realized that I should not and cannot compare different art forms because there is not good or bad, but only diversity across cultures and traditions. This show has taught me to appreciate the indigenous art forms, as well as the stories behind them." Full of energy and excitement, the group headed back to the hotel for their last night in Brazil. For our final journal prompt of the trip, we asked the students to consider ways that they could now "act with humanity and purpose" in light of their experiences in Brazil. My mindset has altered into a way where I am becoming aware of my surroundings and the way people act around us. Now that my mindset has altered, the way I can act with humanity and purpose is by becoming a resource to those with less opportunities instead of just donating things [to them]. Becoming a resource to these kids in less fortunate places [who are] wanting to accomplish similar goals makes me think that to act with humanity is to give these kids hope and help. Giving them knowledge that I have to help kids gives me another purpose for continuing with my educational career. ...marine conservation projects in Brazil. Marine biology is a topic I've always enjoyed, and it has grown into quite a passion for me. Hearing about the local Brazilian community coming together to save the endangered lives of the turtles really inspired me to personally take action as well. During my marine science internship in Belize this coming summer, I will definitely learn more about marine conservation and also specifically about sea turtles. The experience I've had during this trip has further sparked my interest for the ocean and its diverse life and has made me realize that it is something that I want to pursue seriously in my future. One example I can think of is how being here has affected my stance on ecological problems. I've always been eco-conscious...But being here where...no one seems to be able to get the government to claim responsibility for trash clean up [for example], has made me realize just how fortunate I've been and how much of a problem we have left to tackle. I thought my 10 minute showers were frugal. I didn't realize what a water shortage meant, what a whole city without water would look like. the change of heart and mind that will allow us all to see things in a different light and consider diverse practices, opinions, and lifestyles from a different perspective. For example, learning about candomble, talking to an expert, and seeing the dance show allowed me not only to see candomble in a different light, but also other marginalized religions and lifestyles. Every time we understand one foreign practice, we become more open and less judgmental about others. While there are some active things this trip has inspired me to do, such as raise awareness of Amazon deforestation, I have also begun to act with more humanity and purpose through a subconscious shift in mindset. On Tuesday we must say goodbye to Javier, Patricia, Isabel, and all that we've seen in Brazil. However, we leave for the journey back home filled with new perspectives and friendships that will continue to shape the way we encounter the world.